(Natural News) All the rage today on the American Left is “free” everything — healthcare, subsidies, “basic income,” and of course, healthcare. But as rational people understand, nothing in life is really “free” because somewhere along the line, everything has to be paid for. Just because the government is providing it doesn’t mean it’s free; government must take income from productive people in order to finance the so-called freebies. 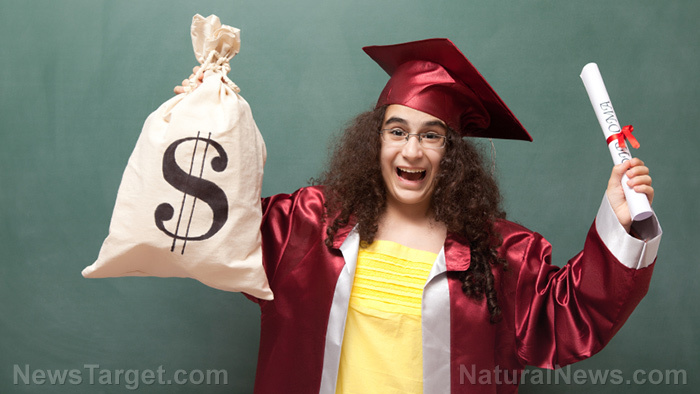 However, Natural News founder/editor Mike Adams, the Health Ranger, recently explored the concept of “free” as it pertains to a college education. “FREE” college tuition for everyone sounds like a great idea, right? In reality, it would destroy the education system and turn universities into adult day-care centers feeding off the government trough of subsidized tuition, he notes in a recent podcast. If tuition were “free,” it would actually be reimbursed by the government. This would cause all universities and colleges to drop their acceptance standard in order to maximize the number of students being corralled through the system, Adams notes, and correctly so. The result? A watering down of education standards and the systematic churning out of dumbed-down “graduates” with no skills and very little real education at all. In fact, that is nearly the case now as so-called “free money” is virtually guaranteed by the government via federal education loans that just about anybody can get (which, for now, still must be paid back, though the Left is trying to abolish that responsibility too). “Free tuition sounds great at first, but once you look into the cause-and-effect outcomes of it, you realize it’s just another really bad idea proposed by economically illiterate leftists who think Big Government can solve all of society’s problems,” says Adams. Some experts note that those who advocate for free college say they are only doing so in order “lift up” our people and create a better-educated society. But in reality, because it’s the Marxist Left — the same people who have hijacked our primary education system and turned it largely into a cauldron of tradition-busting social/cultural experimentation — the real goal isn’t “education” but indoctrination. Adams says he believes that at least some people who advocate for free college really do have good intentions, but that doesn’t mean it’s still a good idea. And besides, “free” doesn’t really mean free, Adams explains. Colleges and universities still have bills and salaries and benefits to pay; they have groundskeeping and other maintenance to do; they have supplies, cafeteria food and equipment to pay for. So they have to receive funds from somewhere. Where? The government? Sure, but again, where’s the government’s money coming from? Contrary to a socialist’s belief, the government can’t just print all the money it wants. So it has to come from American citizens who earn it, then must turn a higher and higher portion of it over to big government spenders. “So let’s be honest about what ‘free’ really means,” says Adams. “It means somebody else is paying for” someone else’s education. Also, Adams touches on another phenomenon that is actually already occurring, thanks to government’s virtual guarantee of school loans: The price of an education would rise dramatically. If colleges (like now) were assured more money, they will only continue to raise their fees, rates and tuition. So you get an endless cycle of education inflation that is already very high. There’s much more Adams discusses on this topic, and you can hear his discussion in its entirety below or by clicking here. Venezuela was my home, and socialism destroyed it. Slowly, it will destroy America, too.